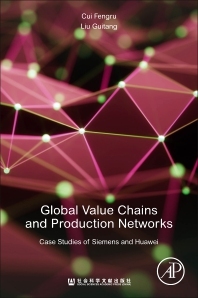 Global Value Chains and Production Networks: Case Studies of Siemens and Huawei presents theories and frameworks that facilitate the evolution of GPN studies, from macro perspectives based on territory and industry to the use of micro (firm-level) data. The book explores these theories and frameworks through detailed case studies of two major corporations, Siemens and Huawei. With the GPN/GVC structure of Chinese firms not well known outside China, despite the growing importance of Chinese firms in the global economy, this guide plays a pivotal role in facilitating the use of data that promise to unlock economic cooperation and value. Dr. Fengru Cui is a member of the research staff of the Party School of Beijing Municipal Materials Co., Ltd. She received a Ph.D. in Economics from the University of International Business and Economics in Beijing. Her research interests include global value chains, global production networks, international trade, international business, and multinational companies. Among her special skills are enterprise strategic planning, brand management and vocational education. Mr. Guitang Liu is a member of the research staff of Beijing Electro-mechanical Engineering Institute. He is an expert on manufacturing informationization, systems engineering and project management, with over 15 years’ working experience in the planning, design, and building of information application systems. He has provided consulting services for enterprises in aerospace, aviation, railway transportation, construction machinery, electronics equipment and other industries.